Magnet Expert Ltd is celebrating its 10th anniversary in business after reaching the prestigious milestone this October. From humble beginnings in 2008, the business has grown significantly over the last 10 years to become a leading magnet supplier in the UK and across Europe, with over 20,000,000 magnets in stock at any one time. When FIRST4MAGNETS® was first launched, the aim was to provide high quality magnets and outstanding customer service, two principles the business still holds dear today. Now in 2018, FIRST4MAGNETS® is a division of Magnet Expert Ltd under the management and leadership of Matthew and Stuart Ellis-Mather, after a multimillion pound buyout in March 2016. Under their guidance, the business has continued along its exceptional growth strategy, with plans in place to expand the business further in the future. To celebrate the company’s 10th birthday, 9 members of the Magnet Expert team will be skydiving from 13,500 ft to raise valuable funds for Nottingham Children’s Hospital. This charitable effort is a part of Magnet Expert’s wider initiative to give back to the local community, with previous aids given to Red Nose Day, homelessness charity ‘Crisis’ and the Lincolnshire and Nottinghamshire Air Ambulance service. The jump is scheduled to take place on Sunday 11th November at Langar Airfield in Nottingham; wish them luck! When the company first opened its doors for business, the team could not have foreseen the journey it would go on, supplying millions of magnets to thousands of customers, including some of the biggest companies in the world like Disney, Virgin, Aston Martin and BBC. 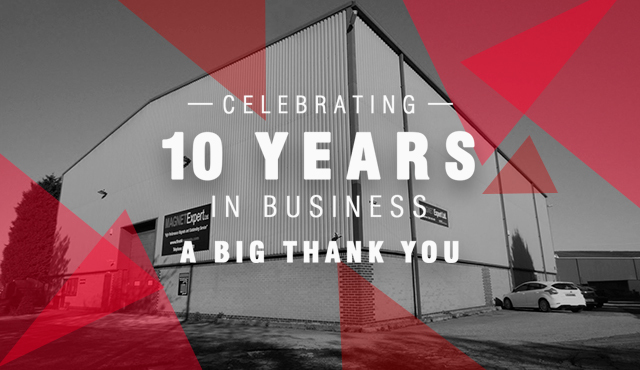 Magnet Expert Ltd would like to thank each and every customer for their business, loyalty and support over the past 10 years. Without their custom, Magnet Expert Ltd would not be the striving business it is today. As a thank you to Magnet Expert’s customers for their continued service, there are many great savings across hundreds of products in our big 10 year anniversary sale. You can browse the range at the website and find yourself an ‘attractive’ deal or two. Thank you to all for your continued support and custom over the years, it’s been a fantastic journey so far – here’s to the next 10! If you have any questions regarding our 10 year anniversary or the charity skydive, please contact us on 0845 519 4701 or email sales@magnetexpert.com where the team will be happy to help.